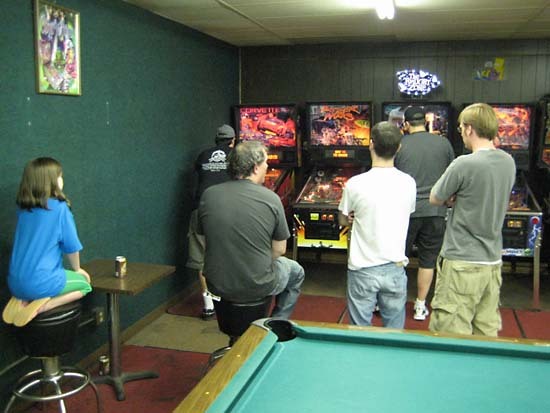 On June 7th, 2009, the first ever Pinball Picnic was held at SS Billiards. 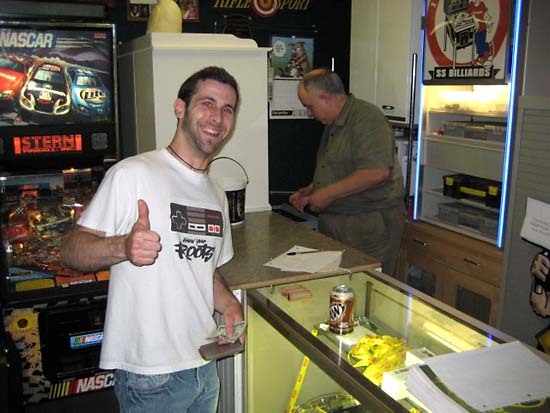 And, Pinball News covered the historic event. 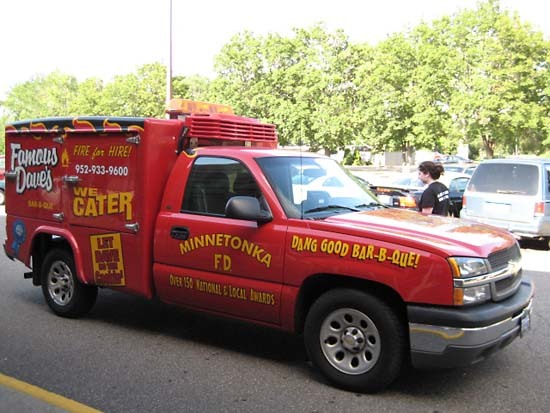 The organizer, Lloyd, explained that the event was an attempt to trying something new to see if anything would fit well into his upcoming anniversary party. 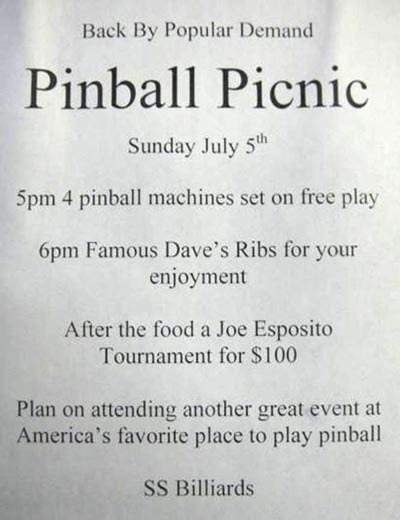 Lloyd keeps trying to make his events bigger and better; which brings us to this Pinball Picnic. As per usual, set up was the sole responsibility of Lloyd. 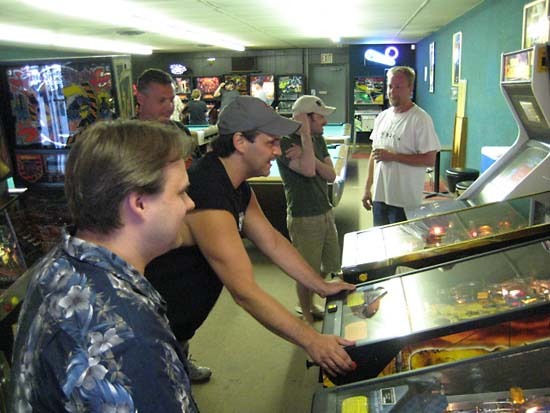 This event was a little different than a Pinball Circus, and unlike the previous Pinball Circus, the arcade was left as normal. 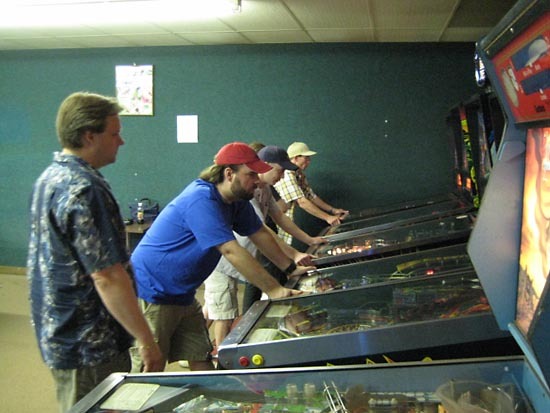 At 5:00pm, a few Pin-heads came in early, while the arcade was operating under its normal Sunday mode, to practice. 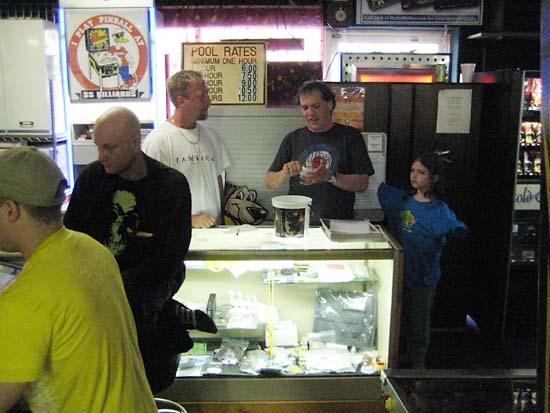 Included in the event were both “newbies” and previous tournament attendees. 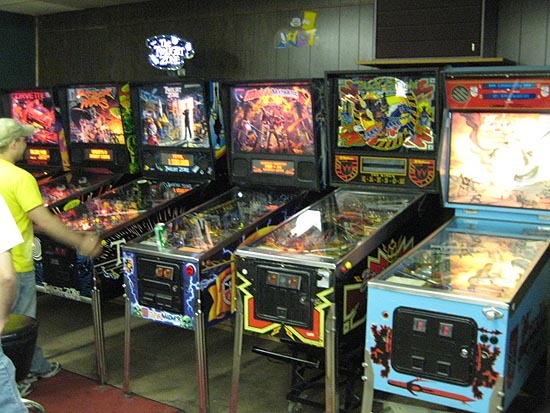 The line-up of pinball machines at the Pinball Picnic is shown below in order of grouping. Up front was a three pack of pinball machines. 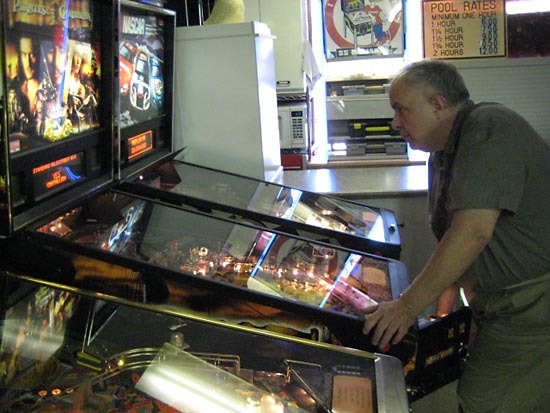 In back was another four pack of pinball machines, plus a game which Lloyd was working on and a game which was both on pay-for-play and for sale. 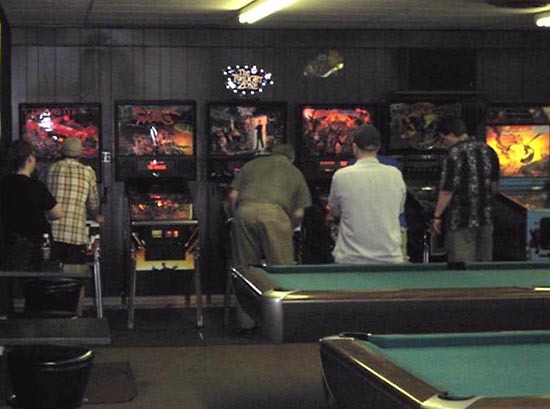 There were more pinball machines in the back of the arcade. Pictured above are Black Knight 2000 and Excalibur. 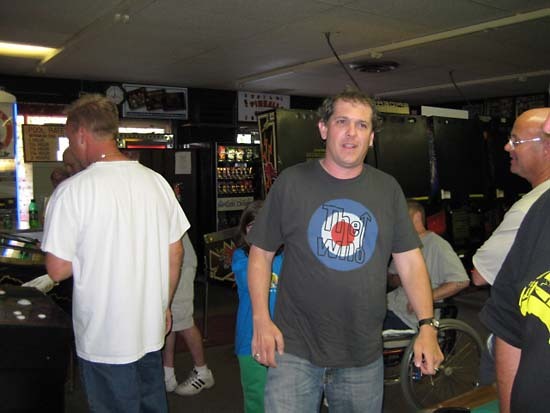 In the back corner was one more pinball machine. 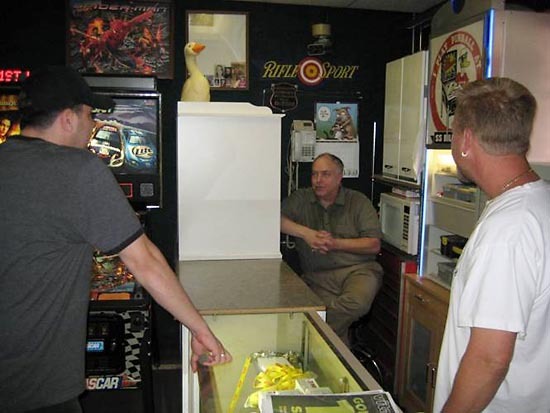 Not pictured in this article but in the arcade were two pinball machines: a collector’s Global Warfare and the same collector’s Creature from the Black Lagoon. 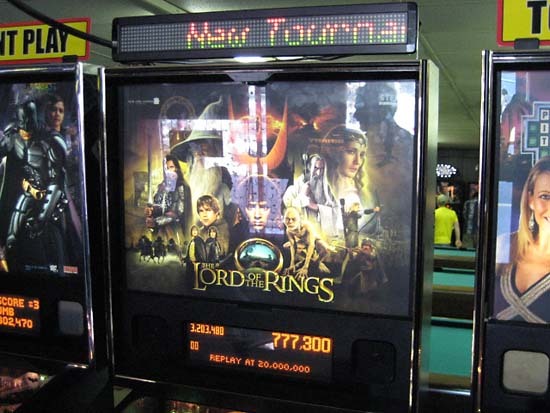 Lloyd had one little problem fixed and the tournament games on free play by 5:00pm. Lloyd learned from the previous tournament that player space became a little cramped. 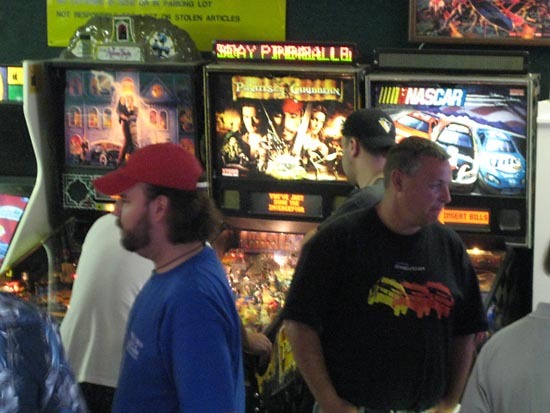 There were four pinball machines, spread throughout the arcade. 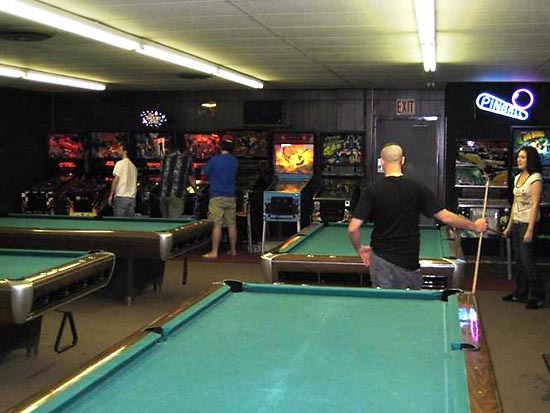 All were available for free play during practice and the tournament. 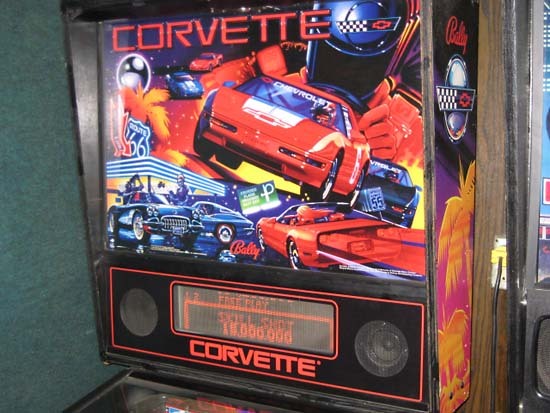 A few people wished that Corvette was not one of the tournament games. 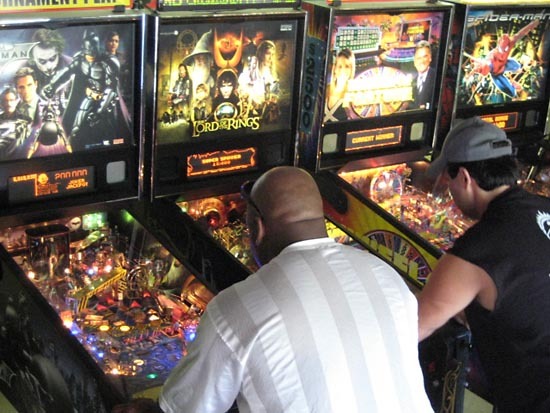 This is because they had practiced on only the Stern pinball machines. 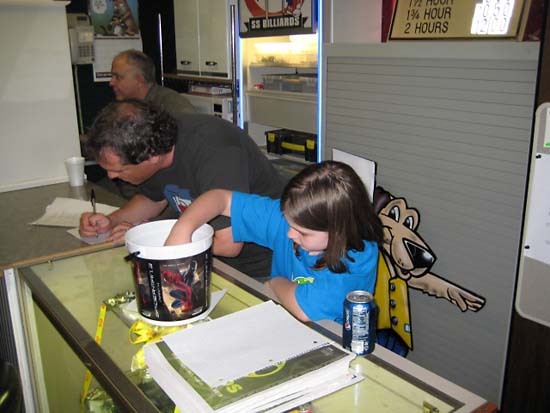 Lloyd believed that the selection of games made the competition more fare to everyone; beginners and practiced tournament regulars. With the free play on games was free food; which was delivered very close to 6:00pm. There were plenty of ribs for everyone. 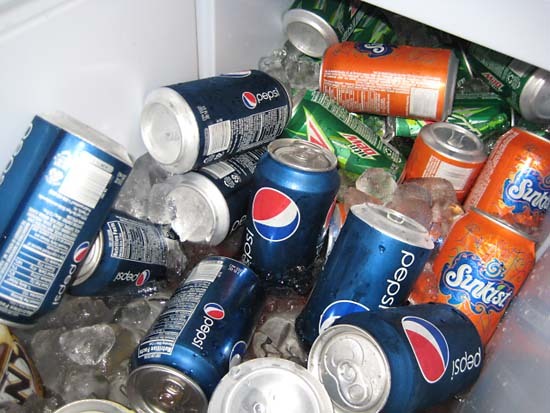 Jim brought in a couple of salads and Lloyd even had two entire cooler of pop available to picnic attendees. Another thing Lloyd learned from the first Pinball Picnic was that people wanted more than a half hour to eat. 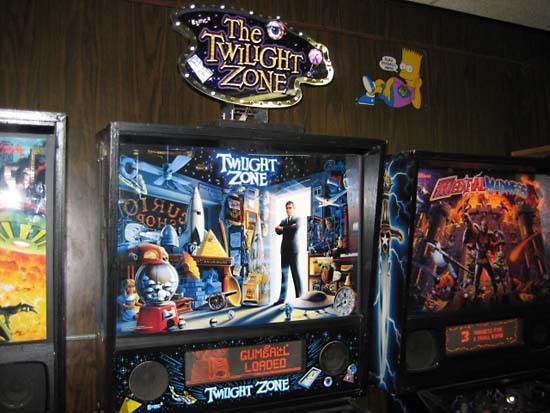 And, seeing as the tournament director was not around at 6:30pm, the start time of the pinball tournament was changed to 7:00pm. But, the tournament director was still not in attendance. 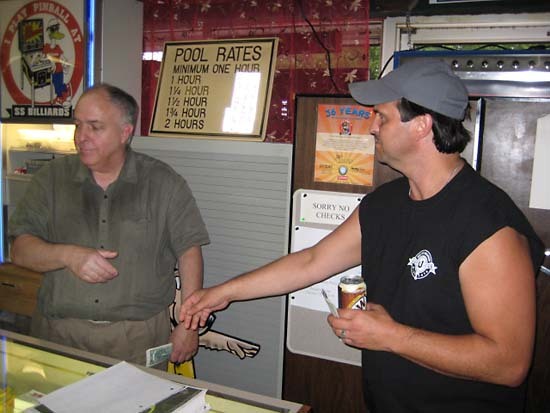 Lloyd made a decision to wait for Joe Esposito to run his namesake tournament. So, the start time was postponed for for five more minutes. Joe rushed into Lloyd’s arcade at 7:01pm. Many in attendance greeted him by heartily shouting his name. Joe had the tournament running before 7:30pm. Joe collected and drew the names of eighteen people. For the first round, players were paired up by luck of the draw. 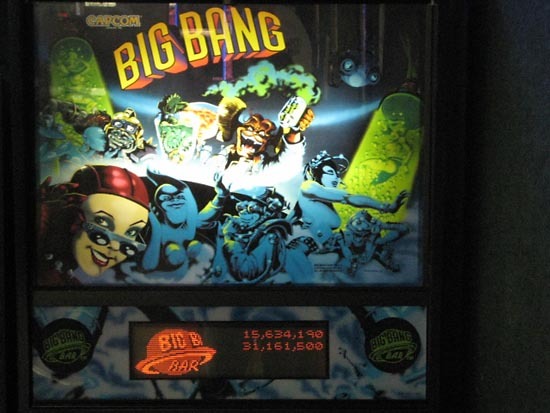 From the four pinball machines available for tournament play, most of the games had two pairs of players. In this case, players one and two competed against one another; as players three and four followed suit. Player order was usually decided by player agreement or flip of a coin. The entire tournament was run as single elimination. For the last round, as the players had been determined by winning, the final game was chosen at random. 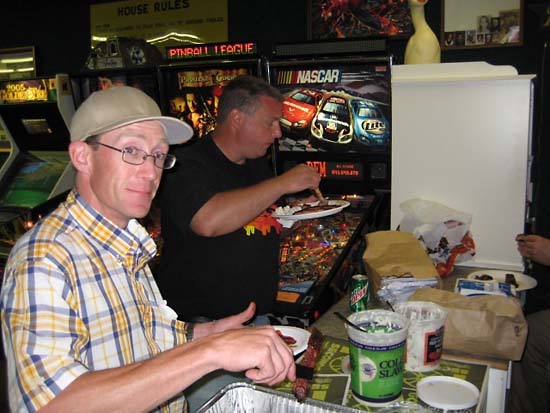 By about 8:00pm, this Pinball Picnic final tournament round came down to a contest between Dave Gorka and Ryan Trego. As were the four other rounds, the final round was single elimination, but lasted until almost 8:30pm. The deciding round was won by Ryan. Thusly ended another successful Pinball Picnic! 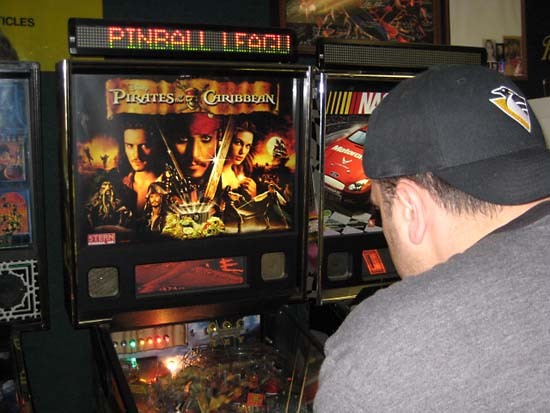 Dates for Lloyd’s next pinball events are in the Diary section, so start making your plans to visit now. 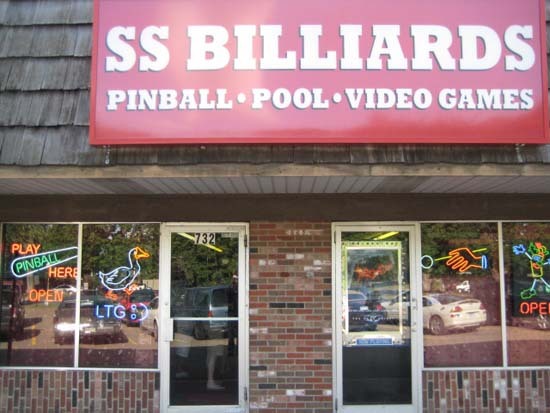 All pictures are property of SS Billiards and are used with permission and courtesy of LTG.